Just the other day, after I have been posting about how IE7 automatically detects feeds I have found a link (http://blogs.msdn.com/rssteam/archive/2005/08/03/446904.aspx) by the Longhorn RSS team at Microsoft which details some information about how IE7 detects feeds on a page. 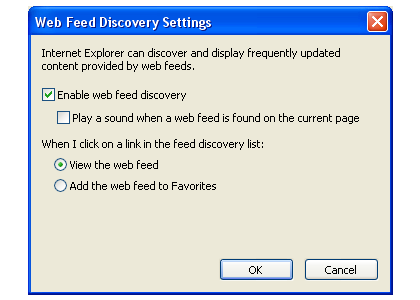 This will enable IE7 to auto discover the feed for the page. What IE7 will not do is to automatically show feeds that are linked to directly on a page. Furthermore, if the if the "type" attribute on the "Link" tag is "text/xml" (like it used to be on my page) IE7 Beta1 will not pick it up as a valid feed. I have no idea if this will be fixed in the next versions. I would have liked it to display a notification of other feed links on a page, so that I can quickly subscribe to these. On my blog, related topics are given to the user via a link to an HTML page or via a link to a RSS feed. I would have liked it if some of these would be visible to the user via the feed notification button. I have adjusted my blog to now indicate that it has a feed (thanks to the RSS teams blog article), however it still doesn't render in IE7 properly. One thing to note about the RSS feed is that it is converted by 2RSS.com on the fly, so it will also include adverts in. Sorry about that. I have updated this entry at (http://www.kinlan.co.uk/2005/08/update-about-ie7-feeds-not-working.html) after to speaking to the RSS Product manager at Microsoft. Seeing as this is my most popular post, I would appreciate it if you take a quick look at the link. Thanks. 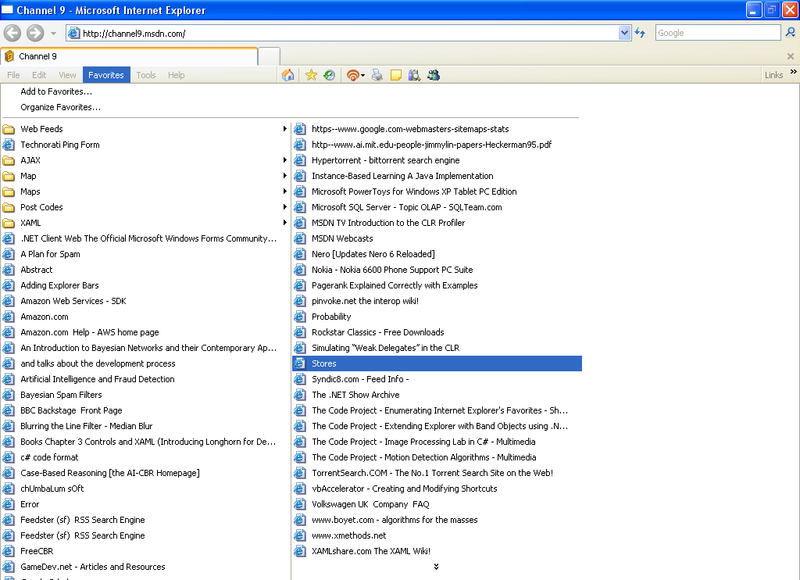 This is the blog entry of feeds that don't work with IE7. That is feeds that don't display in the IE7 Feed viewer. When I say don't display, I actually mean that they don't render in the new format that IE7 supports. I would like to know what is special about these blogs to cause them not to render correctly. With the introduction of IE7 and the automatic RSS feed detection and the special search tags that I am now including at the footer of each blog entry, I had a thought: Why not include all the feeds specified into an RSS feed that summates the results of all the tags. This feed would be viewable by your favorite browser or feed reader. It would get the results of each RSS feed and genereate a new RSS feed, and the best bit was that it shouldn't requrie any special server or program; Just the browser/feedreader that the user used. I quickly thought about this and thought the possiblilties would be endless (well nearly) I could provide a short feed file, that linked to the other blogs/feeds etc, my server resources would be minimal, the feed owners would see extra traffic and hits to their blog (fully credited of course) and the users would get the best of both worlds. All the processing would be done on the client. I knew that the RSS 2.0 format could be extended with custom schema elements, so I could extend the channel element to include links to extra feeds. I developed an extension to the RSS 2.0 format, it would extend the Channel element by including a new "Sources" element containing a collection of "Source" elements each of which simply pointed to the RSS feed that it needed to include. I then developed a simple XSLT that would scan this "plain" RSS feed and pull in the RSS feeds specified by the Source element. I know MSXML does this. There is the ability to import another set of nodes from an external document in MSXML's XSLT engine (it might be standard, I am not too sure). I tested it locally and it worked! Bonus! This is easy I thought to myself. 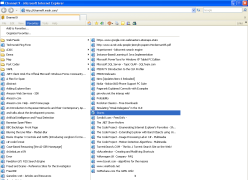 Here in front of me, I have 3 seperate RSS feeds merged into one simple feed. I thought on, with a little more development I could provide sorting, so that the output is sorted by date and all the feeds are merged in to one list. Then it hit me! I uploaded the xml and the xslt to my web server, I set it to so that it was pulling in two remote technorati feeds. I typed in the URL and .................... ERROR! Pants! Why did this happen? I was essentially pulling in data from a domain other than the one I was in. I was stopped in my tracks, I couldn't pull in anything that wasn't on my own domain (kinlan.co.uk). I took a little more time to think about what had happened and I realaised several other things that would stop me down the line. It is fine and dandy having data pulled in from different sources by the client that needs them, but there is no guarantee that the engine that pulls them in will have an XSLT Engine, let alone MSXML. If I wanted it all done on the client, I can't use any fancy AJAX stuff either, nor could I use any MSXML objects in the browser for the same reason as the previous point. Both of the above points meant that if a non Internet Explorer client, perhaps RSS Bandit etc pulled down my feed all it would see is an empty blog with my custom elements. Here are the links to the XML and the XSLT. I was pretty sure that there are some feeds that get found by IE7 yet don't display correctly if at all in the "Feed View". If you direct Internet Explorer 7 towards channel9.msdn.com, you should see that it detects a feed is available, now if you try and view the feed all it shows is the XML. Why doesn't it XSLT the feed correctly. I don't know? But if you do, let me know. I am thinking of starting a list of feeds that do not appear to render correctly, it might be a bug, it might not. But if anyone from Microsoft stumbles accross this site it might help them. Doh, "I good test to check out the alpha transparency and I missed it!". should have been "A good test to check out the alpha transparency and I missed it!" I missed out on the last post trying out the alpha transparency. I know its been blogged about here, but I should have really tried it out. My Opinion however is that this dialog is a little bit thin on the ground. It doesn't really provide much, other than a partial solution for my suggestion in "this post". I would still really love to be able to have options that I can choose from on a per feed basis as IE7 finds them. Not just "view" or "auto add to favorites".